distribution Essentially throughout the Coastal Plain, and widely scattered over most of the Piedmont. A photo record in 2016 extended the state range into the northwestern Piedmont (to Wilkes County). Apparently absent from the mountains. abundance Difficult to determine because of similarity of appearance to the Swift River Cruiser and the fact that river cruisers perch infrequently or too high in trees for easy observation/photography. Based on the number of records (mostly collections and recent photos), fairly common (to locally common) in the southern half of the Coastal Plain, and uncommon in the northern half, though this difference is possibly due to the comparative scarcity of field work in the northern counties. It is clearly rare in the Piedmont. flight Late May to mid-October in the Coastal Plain. Not surprisingly, as there are many fewer records, the known flight in the Piedmont is from early June to mid-September, and very sparingly to mid-October. habitat Mostly around larger creeks and rivers, rarely at lakes. behavior Males cruise long distances over rivers and larger creeks, mostly about 3' above the water, and the flight is slower than in other river cruisers. Away from water, they behave like most other river cruisers, flying long beats over roads and sunny trails in forested areas. However, they tend to fly higher than the others in the genus, often 15 or more feet off the ground. comments This is one of the longest of the state's dragonflies. 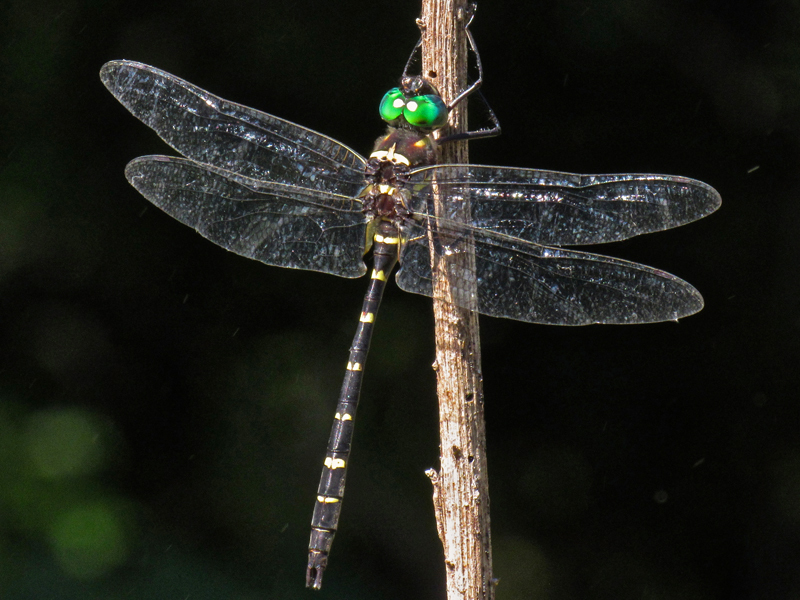 However, its abdomen is quite slender, and thus when seen overhead in flight over a road, one can separate it from the similar-sized Swamp Darner (which has a robust and tapered abdomen). Though reportedly it perches often, most will be seen in flight, where it often occurs with Swamp Darners. Because it can be easily confused with other river cruisers, and as the Swift River Cruiser is numerous within the range of this species, observers must be cautious when submitting sight records for the Royal River Cruiser. Mark Shields found the species to be fairly common to common along some of the rivers he cruised in 2015 and 2016, and we now have several daily counts of at least 20 individuals. Comment: Craven, 2018-06-16, Swift Creek; 7 km section between Cool Springs Boating Access Area and NC 43 bridge, by kayak. First record for county. Comment: Sampson, 2015-08-23, Black River by kayak from Ivanhoe Boating Access to 0.5 km upstream of Dr Kerr Rd bridge - Common. 2 males netted; note incomplete ring on S2, lack of club, small paired yellow spots on S8, lack of lateral spots under S7-9, no connection between lateral stripe and dorsal spots on S3.